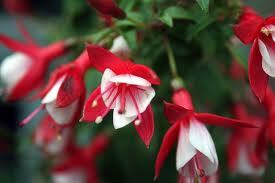 It is often said that fuschias are difficult to grow. But if you give it the right home, good food and loving care…just what everyone needs…they will thrive. 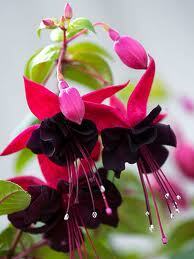 Fuschia blossoms come in shades of deep purple and magenta, or fuchsia. Some pop up in various hues of pink with petals of brilliant white. The flowers droop down from the branches, shooting in all directions. In a hanging basket, this natural flow of flowers is allowed to follow its own perfect path to perfection. Or, just simply put in a pot and stood in a sunny indoor spot in front of a window. Hence, can be used as an indoor plant too. Outdoors, you would do well to place them in a shady area. A covered veranda or a shaded patio filled with a variety of fuschias is a pretty sight to behold! Go on, give it a try, let your green thumb speak for itself. If the fuschia grows lush, thumbs up. But, if, on the other hand, it looks scrawny, ne’er mind…just change the spot. The plant will let you know if you’ve picked the right spot…by flourishing and blossom well. 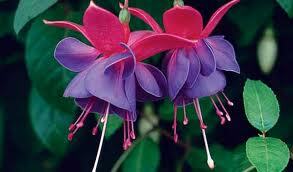 Interestingly enough, but not surprising, the flower symbolism associated with the fuchsia is confiding love. Indeed, for me it was, undoubtedly, love at first sight! What beauty! This plant adds a splash of colour and demands attention. 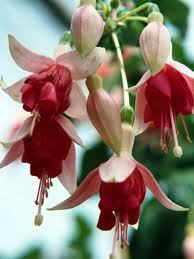 Aye, Fuschia…my magnificent ballerina…dance on. I too adore fuschias. When I wrote this blog, I was astounded by the huge variety of this beautiful flower! The way the petals fall, their colours, shapes…truly magnificent. It’s poetry!